It isn’t really surprising that given my name and the fact that most of my life is spent with my hands in some kind of dirt that many people give me packets of poppy seeds as gifts and I have quite a little collection. Mostly they just sit in my seed box as I don’t really have a use for them, with a few being sown here and there every so often. 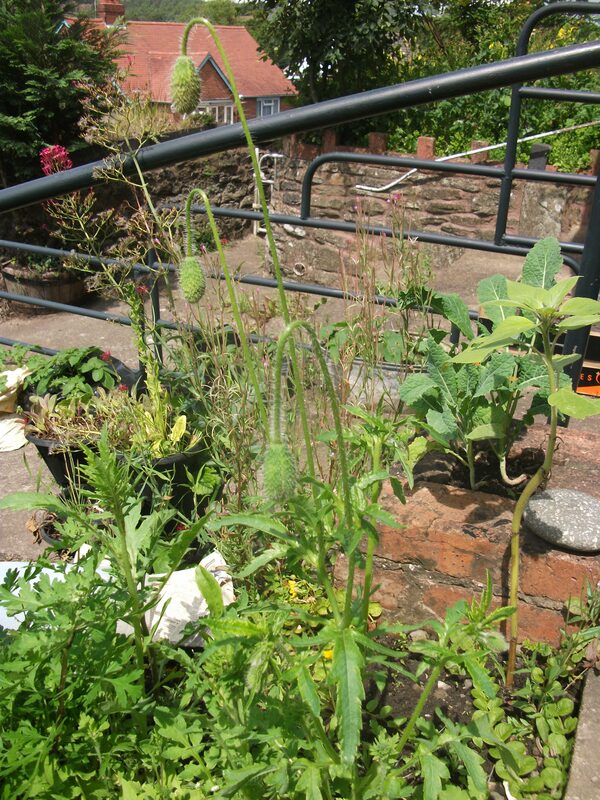 Now I have a poppy plan though; after having a poppy seed and carrot muffin I want to grow and make my own. So out came the seed boxes and I have been through all of the poppy seeds I have, I mostly have lots of smaller headed poppies but there are a few ‘good ones*’ and I am not too late to sow some of them, including this one which actually talks about eating the seed heads in the description. Carrots don’t seem to be doing so well this year but there is still time for them too. I spent some time at the allotment this afternoon with mother and middle-younger-sister. We have had the plots since a year ago last Friday, the soil on the beds that were manured last year is so nice now. Whilst we were there I planted out some garlic, onion sets (Setton) and sowed some carrots (two rows of Chantenay Red Cored 2 and one of Early Nantes 5) and planted the first potatoes, Mimi and Charlottes. I used a plastic bag peg loom mat to kneel on, it is one of the biggest mats I have made and was very comfy folded over a few times. This is a little later and not as long as I had planned (the camera’s batteries kept going flat, and of course I hadn’t even thought about needing such a thing at Christmas) so there are a few stops and starts but I think you can get the idea of it any way. The carrots weren’t as big, or as purple, as I was hoping for but they still tasted very nice! Today was the winter solstice, the shortest day of the year. From now on days will be getting longer and everything with start to wake up. As a sort of celebration I have spent this evening making paper pots and sowing peas, carrots (to be grown in buckets until the warmer weather when they can go outside) and a few leeks. I’ve been reading a little bit about how leeks can be started off now in polystyrene boxes so thought I would try it. 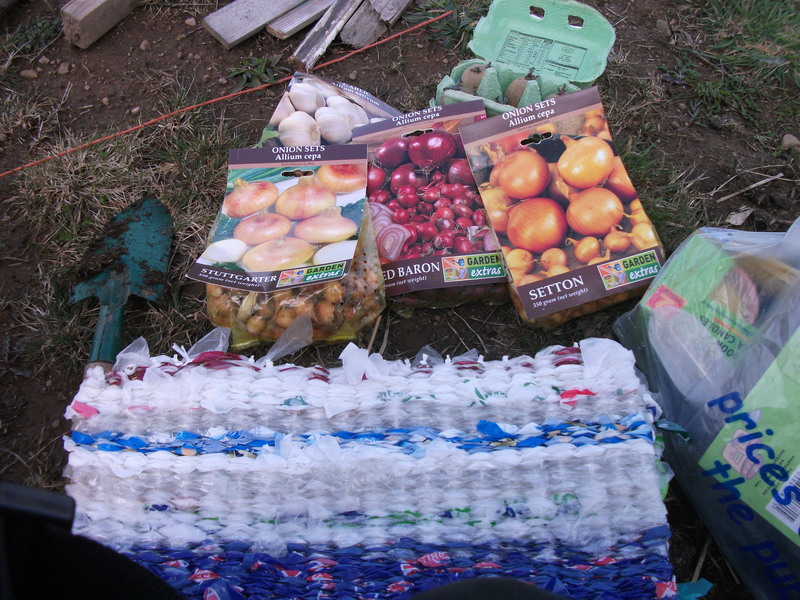 The carrots and leeks were also to do my second bit of moon planting, so far I’ve only managed root crops on the right day, last weekend I planted some onion sets and garlic. Rhys has spent this evening making chocolates for Christmas presents, and when I first got home from work we tried to ‘candle’ the quail eggs. It didn’t work but I’m hopefully, the weight has changed in them from how it feels when they are first laid. It will be time to stop turning them in the next day or two ready for hatching. I started on my Christmas shopping, I’m still not convinced that Christmas in November is allowable, but I’m realising that planning is everything. For example under my normal rule of ‘do-not-even-try-to-talk-to-me-about-Christmas-until-December-the-first’ would not have allowed me to have sown carrots all those months ago to have carrots ready to be freshly harvested on Christmas morning, which I’m really looking forward to but without forward planning it wouldn’t be happening. So I’m coming round to the idea that some Christmas before December is allowed, just not to much. I just find Christmas disappointing if I’ve been waiting since October for it, nothing can live up to that sort of build up. I’m hoping for most of my Christmas presents to be homemade, but this was a new-ish book I knew someone wanted and I found it on Green Metroplis, there was only one copy on there and I know it won’t be there for long… In fact I’ve already bought it so it’s gone. Today was the local food festival; it’s a nice little event. The weather wasn’t so good for it, it rained all day and then started to brighten up just as it was time to start packing things away. It was still busy though. I was working as a Play Ranger, drawing and making snow flakes, so I don’t really get to see much of the event but it was a good day. I always enjoy events more if I’m there doing something than if I’m just there visiting. I like to watch people, that’s the most interesting part of events for me and sitting drinking hot chocolate and watching people, in between drawing and snow flake making, is a very pleasant way to spend a day. When I got home I watered all the plants in the polytunnel, in the bucket of carrots you can see little baby carrots forming they’re about the thickness of my little finger, they don’t look very purple though, more a pale pink colour. There is still a couple of months to go until they need to be ready so I guess they will get darker. When I get time I think I need to earth them up. Today it has not been nice, it’s been cold and raining all day. Not nice rain either, cold, wet, drizzly rain that starts every time you go out to try to do anything. Still the weather forecast has been storms and rain since Wednesday so we’ve had a fair run of good weather. It’s been nice as well to be indoors with all the stoves lit, yesterday morning I went and got a new chain for the chainsaw and my brother spent the afternoon cutting wood while me and my sisters fetched big arm full’s of wood to him and cleaned out both the woodburners and got them going. The house is full of a warm, fresh, smell now that you only get when you haven’t had the fires lit for a while and it sort of creeps through the house. My brother gave up on trying to dig out the drain, that’s not really draining very well, and him and my dad started work on fitting the new Rayburn in the kitchen. After moving it into place work was halted by the need for olives, some sort of something for pipes, of a different size than we had so me and mother were sent of to Focus to find some. They didn’t have any in the right size so work on the Rayburn was halted for the rest of the weekend, but they did have seeds, and reduced plants. I bought seven pots of strawberries, all for 10p each, two thyme plants, one golden and one green for 49p each, four chilli plants for my sister and a load of pansy’s for my dad. I also bought two packets of pea seeds, one verity to sow now for an early crop next year and the other packet to sow first thing in the spring, two packets each of Focus’s own brand carrot and beetroot seeds, for growing in tubes in the polytunnel over winter, a packet of parsnip seeds, to try in tubes in the polytunnel over winter to see how they do, and a packet of cabbage seeds for next year. I started ordering some more seeds for next year today, lots of different colours of carrot. Some red, two different purples, yellow and some orange (mini and giant.) I’ve tried to order non-F1seeds, the mini and giant are, so as I can have ago at saving some seed from them, and the yellow coloured ones are an heirloom verity. I’m a member of an online survey site, were you fill in questionaires, mostly about shopping, and you collect points which can be exchanged for lots of different things including PayPal credit. I’m really pleased with myself, I picked out the seeds I wanted a while ago and have been saving up my points until I had enough for the seeds I wanted. It feels good and I can’t wait until the seeds arrive. The new T&M catalogue came the other day, I’ve add up how much all the seed potatoes that I want and it’s £50 worth, ouch. There are two heritage/heirloom collection that I want, I want all the different types potatoes but both collection add up to 160 tubers so I have posted a ‘potato share’ in the LETS newsletter and the Freecycle café and have had a fair few responses from people interested. One of them is someone from a community garden who have offered to swap for some of the heritage seeds that they have saved. It started to feel like winter today, it was a nice day and the sun was out but it was cold, and still is. I think there might be a frost tonight. I’ve said for a couple of days running that I think we need to light the wood burner but it really had to be done tonight. Tomorrow I’m off and one of my jobs is going to have to be getting a new chain for the chainsaw. Normally we use a handsaw for cutting up all the wood for the wood burners, it’s always been everyone’s job to saw a box full of wood each day in the winter when we were growing up but this year we’re all almost grown-up, not that I feel at all grown-up, and there just isn’t the time in the day anymore. We’re getting ready for Apple Day at work, it’s in two weekends time, and today I went out collecting apples (from Freecycle) to put through the press and it was really nice. I wish we had apple trees, the only ‘useful’ tree we have is a sweet chestnut tree. When me and mother went to get Kniteshade on Sunday the motorway was lined with apple trees covered in fruit, all going to waste. My dad has a theory that the reason motorways and railway lines almost always have fruit trees along them is because of people throwing their cores out of the windows. Well my wish was granted, I had the last two weekends off and both have had good weather. It’s been so nice to be able to be out doing things. The last week or so has felt very strange, it’s been busy but is hasn’t necessarily felt like it was busy. Everything feels like it is slowing down for winter now. The weekend before the one just gone was mostly spent re-doing the goat pen, putting up a new pallet fence and digging out the wet mud that’s built up over the last two wet summers. There’s now paving down over half of it and we’re going to try grass seeding the other half and see how it takes. We also threw a surprise party for Rhys, it’s his 30th this year and even though his birthday isn’t until this week his party was last weekend as I couldn’t get the hall I wanted for this weekend. It was a good party, lots of his old friends came and he didn’t know a thing about it until me and him got to the hall. Keeping him out the way broke up the time on Saturday in a strange way, when I have time off I hate leaving home unless I really have too as I always have something that I want to be getting on with even if I’m not getting on with it, so we don’t normally go out together much, especially in the day, but it was a nice afternoon. We went and picked somethings from freecycle up and then had a picnic. Sunday I had a cold and Rhys was hung over so not much work got done. I started cutting back all the caterpillar eaten purple sprouting and sprout plants and sprayed them with a mixture I made up from a recipe out of an old gardening book, boiled tobacco, to see how well it works. The plants have started growing back and I think they will come back but of course they are going to crop late. I’m still not daring to plant out the kale or spring cabbage just in case but I will have to do it this week really, there is only so much growing on they can do in pots and it always takes them a while to settle after re-potting. I got my strawberry plants; I had bought 50, not 30 like I thought from ebay. I can’t remember which day they arrived, or which day I potted most of them up but they are really nice plants all very well rooted and not at all dried out from being posted. The last few plants are in a bucket of water waiting for me to finish the job off. I started off by sorting all this year’s plants and runners out, I got 5 free plants from a magazine and they fruited well this year, even though they were left in the same bucket I had put them in ‘for the time being’ when I got them last autumn and they’ve produced some good strong runners. We’re going to have so many strawberries next year! During the week I’ve carried on with freezing courgettes, the plants still have plenty of fruit coming on them and, touch wood, the sweetcorn should be done soon as well. The chickens have started getting on the bed (the old muck heap bed) and seem to like the mystery squash plant that’s on there, I don’t think it’s going to manage to fruit. 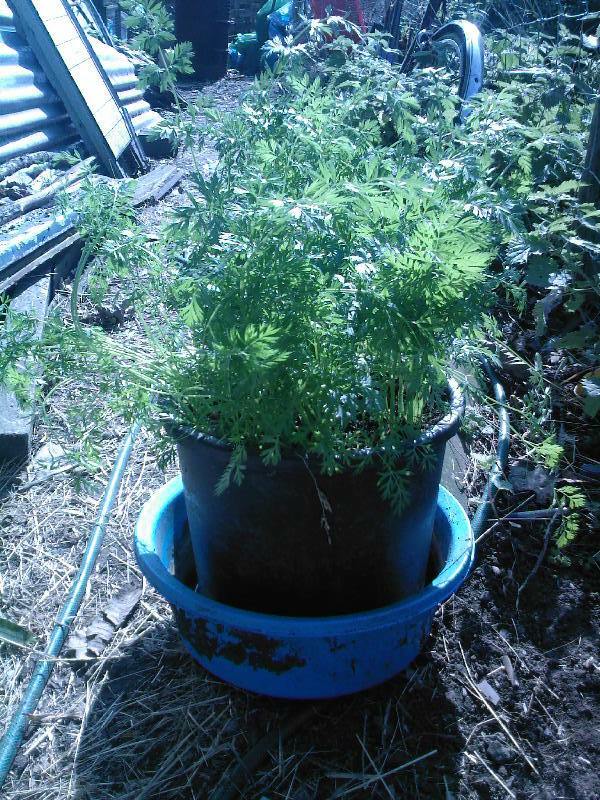 My bucket of Christmas carrots are doing really well, it looks quite impressive. I’m going to sow some more carrots in buckets and start them off in the poly tennel, they should over winter in there alright. I’ve been picking a few runner beans as well, the plants went in really late, at the time that other plants put in at the right time started fruiting but they are doing well and still have plenty of flowers on. The bees seem to like them as well. On Friday I had arranged to go and see a male goat, I need to get a new one this year as my last year kid is ready to breed from this year, but what sounded like a much better one for me came up, so after pottering in the garden, I finished cutting back the sprouting plants and did some weeding, I went to see my half sister and helped her start putting up her poly tennel. It was a really nice afternoon. 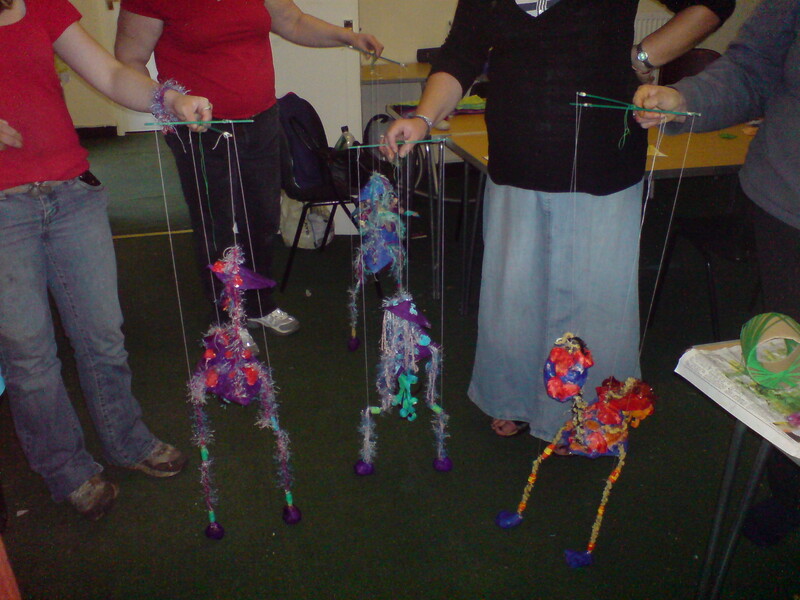 On Saturday me, mother, middle-sister and my brothers girlfriend went on a puppet making workshop which was really good fun, then we came home and I ended spending ages washing up, not the normal day-to-day washing up but emptying the cutlery draw and cleaning that out and the plate racks. 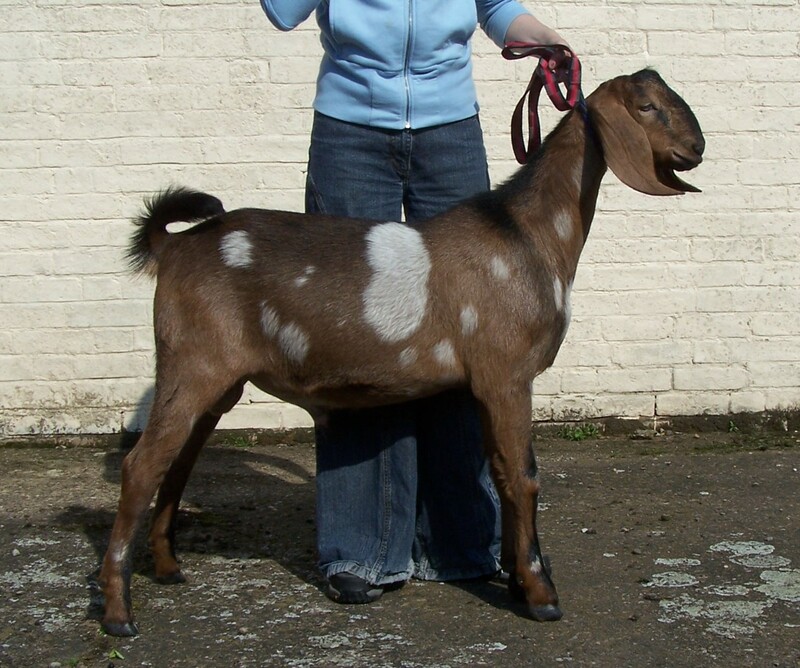 And on Sunday, this is very exciting, I got my new stud male goat, Kniteshade. He’s gorgeous. A few years ago I saw a male who I really liked call Holdbrook Ghost, his farther, Fungus was breed champion and also nice but I really liked Ghost. I never stood a chance of getting him though has he was exported to a herd in Holland (or somewhere like that) not long after I had ‘found’ him. When I bought my last male, the breeder that I got him from also had Fungus. I bought a female from him that was put in kid to him, Fuscia, but she started to kidded over a weekend when it snowed, we knew something was wrong with her but we weren’t 100% sure she was kidding. We called the vet but they had just called all the vets back in as the snow was getting worse. We did all the things they suggested, including give her lots of sweet black tea to drink which she now loves and will do anything to drink if you go near her with a cup, but she wasn’t ‘open’ at all so we hoped that one of the kids was just laying in odd way and she was uncomfortable. A few days later she started to kid properly and pushing, but again was having problems and after me, mother and middle-sister had done all we could (me and my sister have been kidding and lambing since we were little and my mother has for even longer) the vet was called again and after a lot of trying delivered three massive male kids, all dead. The vet said that two of the kids had tried to come out at the same time, one over the top of another, and got very stuck. They were all very pretty but none of them were like Ghost. Any way, Ghost is the grand-father of Knitshade, and his great-grand-farther is the half brother of my first goat who I lost during foot-and-mouth. So not only is he gorgeous, I would have had him just for his breeding even if he didn’t look as good as he does. For an ex-mining market town, our local town is full of life. It has two green grocers, four butchers, two chemists, two florists, two DIY/household type shops, a whole food shop and two supermarkets, one a Lidl and the other a Co-op. You can pretty much buy anything there you might need, so long as once you’re past the age of about nine you don’t mind wearing second hand clothes from charity shops or paying horribly expensive price for new clothes from the ‘department’ store in the town. You don’t really need to go anywhere else, other than for a change of scene. It’s not often that the town centre isn’t busy, and the supermarkets seem to live along side the town centre shops quite happily but that all looks like it’s about to change. For the last ten years Tescos have been trying to build a ‘superstore’ there, at first they tried to get planning permission on a site on the industrial estate. I’m not completely sure of the details of why it was turned down or whether it was on the same scale as the one that they are trying to build now but thankfully it was turned down. As what I imagine normally happens in areas where large changes are proposed, there was/still is a lot of debate about if this is a good or bad thing for the town, protest marches were staged by both sides, petitions produced and lots of letters written to the local newspapers. People on both sides do feel very passionate about the subject. The argument for is that it will bring employment to the area, 300 jobs are planned, people will come into the area to shop, the store will help regenerate the town and the two supermarkets that the town currently has are rubbish. The argument against is the proposed store is far to big for the population of the area, it will kill off the small businesses and shops in the town centre and possibly the other two existing supermarkets (the site planned is right next to the Co-op), the traffic will be horrendous, Tescos are in no way community minded and if people want to shop at Tescos they can always use the free bus they provide to get the existing store locally and possibly the biggest reason is this store is planned to sell EVERYTHING, all in one place and that is not a good thing for any town. Although the argument against basically hangs on the fact that Tescos are “baddies”, I’m not giving away any prizes for guessing which camp I’m in. The only good part of the plan is that the store would create jobs, the flip side to that is it will be destroying other businesses in the area who also offer employment and honestly if I have to be a shelf stacker or shop assistant I would much prefer that it was in a small business than a facelessly-owned supermarket. I do want to mention, however, that I do sometimes shop at Tescos. Any way, that is the long way round to explaining what I’m trying to post about. With all the above as background, the other day me and mother were out buying vegetables for dinner, we were using one of the green grocers in town and needed carrots, I can’t remember what it was we were having for dinner, I’d gone round picking out the English onions and potatoes but the only carrots that they had were from Spain, we did buy them but I do know that if we’d gone down the road to the Lidl then we could of bought British carrots no problem, they only have British carrots in stock at the moment. We bought them from there because however poor we might be at times we do normally try to buy from the local shops and then whatever can’t be bought from the smaller shops (or is much cheaper) we buy from the supermarkets. In the ideal world we should be growing our own carrots, the next step away, in my thinking, is buying our carrots from friends, neighbours, etc. then from local shops, then supermarkets, but I’ve never really thought about where the carrots come from in the local shops. Just that it is better to buy from smaller businesses than supermarkets. I suppose the ideal in that situation is for smaller shops to have local/local-ish/British produce, but when they don’t which one is best? The green grocers is only going to stay there, when and if Tescos get here, if people like me buy the Spanish carrots, which increases demand (OK, a very small demand, I don’t eat that many carrots) but Lidl’s, which sell British carrots, does stand a better chance of staying in the town than the green grocers. But that still doesn’t answer the question of which is best? The text and pictures on this site are my own work, please do not reuse any of it without gaining written permission!